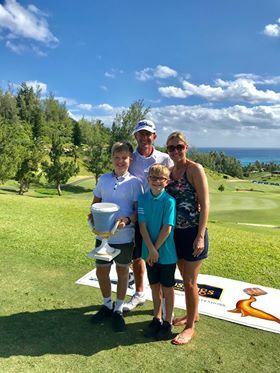 SOUTHAMPTON, BERMUDA – The BERMUDA 3s World Team Championship presented by Goslings – an exciting new golf championship contested by pro-am teams from around the world – was won by professional Simon Lilly of Northamptonshire, England, at five-under-par. Lilly took over once the tournament arrived at the final round venue, the famous par-3 Turtle Hill Golf Club at the Fairmont Southampton, on Wednesday. He fired a course record, bogey-free seven-under-par 47, and maintained his lead as he cruised to victory on Thursday over professionals from around the world. In the team competition, Cary Sciorra (P), Tom Tracy, Tom Corr and John Coleman of Medalist Golf Club in Hobe Sound, Fla., won the low gross division. In the low net division, Bermudians Dwayne Pearman (P), Michael Dunkley, Christopher Morris and Craig Christensen of Turtle Hill prevailed earning the gold medal. BERMUDA 3s presented by Goslings, is the creation of two golf industry veterans, Joe Steranka, former CEO of the PGA of America, and Honda Classic Executive Director, Ken Kennerly. 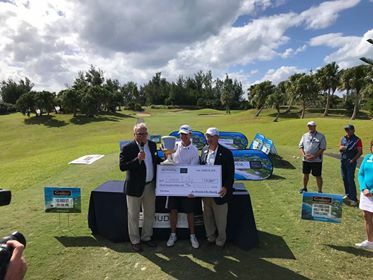 Sponsored by the Bermuda Tourism Authority and Goslings Rum, PGA Professionals from the U.S., Great Britain & Ireland, Bermuda and Estonia competed individually for $52,000 in professional money. Bermuda has been a popular international golf destination since hosting the PGA Grand Slam of Golf from 2007-’14 at Mid Ocean and Port Royal. The Fairmont Southampton was the host hotel for those competing and home to championship venue, Turtle Hill Golf Club. PGA Professionals or amateurs may register online for the 2019 Bermuda 3s at bermuda3s.com, via email at info@bermuda3s.com or by calling (561) 379-2134.